Recently, Cherna Moskowitz of The Irving I. Moskowitz Foundation donated $50,000 to the Pancreatic Cancer Action Network. Donations like hers assist PanCAN and their vision to double the survival by 2020. It is a tall order, but it’s also attainable through fundraising, community and charity. In order to change statistics on Pancreatic cancer for all of those who have and will be diagnosed in the future, it will take many people like Cherna Moskowitz coming together to fight for this cause. The Irving Moskowitz Foundation contributed $100,000 to help people in tornado-ravaged Oklahoma. The city of Moore, Oklahoma faced crisis on May 20, 2013 when one of the worst tornados destroyed approximately 2,400 homes and killed 51 people. Over 10,000 people were directly affected by the tornado. After hearing about the devastating tornado the struck Oklahoma, the Irving Moskowitz Foundation realized that it was necessary to help in any way possible. 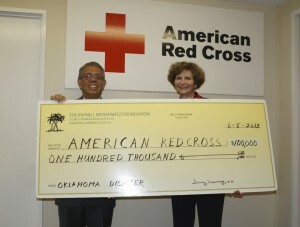 The monetary contribution made by the Irving Moskowitz Foundation and Cherna Moskowitz to the Oklahoma Relief Effort will help the Red Cross provide shelter, food, and many other services to the affected families.The Irving Moskowitz Foundation is charitable non-profit organization that is committed to provide aide to the less fortunate. The foundation’s monetary contributions to the American Red Cross exceed $1 million dollars. Joining the relief efforts lead by the Red Cross helps the foundation carry out their humanitarian mission. The Irving Moskowitz Foundation was established in 1968 by Dr. Irving Moskowitz to help people in need regardless of race, religion, or politics. Dr. Irving Moskowitz and wife Cherna Moskowitz share philanthropist views and have made it their personal mission in life to touch the lives of as many people as possible. The foundation has contributed millions of dollars to numerous non-profit organizations that provide services to people in need. Even though the Public School system has suffered tremendous budget cuts over the past few years, iPads are the new educational tool at a Hawaiian Gardens middle school. Irving Moskowitz donated $30,000 to fully equip classrooms with iPads that will enhance student’s learning experience at Pharis Fedde Middle School’s Global Scholars Honors Program. The iPads will be accessible to students participating in the Global Scholars Honors Program, which is a program designed to prepare students for higher education through academic enrichment, reflective college exploration, and community building projects. As one of the school’s program community partners, Irving Moskowitz contributes towards the purchase of iPads that will be used by students enrolled in this academic program. His belief in helping those in need is the philosophy by which he felt compelled to make a contribution to an educational program that would benefit the students at Pharis Fedde Middle School. Irving Moskowitz realizes how important it is for students to receive the highest level of education and to be provided with the tools in order to achieve academic success. “The iPads will be another educational tool that will not only motivate students, but also challenge them to think outside the box with the many applications available at the touch of a finger tip,” said Irving Moskowitz. Students at Pharis Fedde Middle School are ecstatic about having iPads in their classroom. Most students have only experienced navigating an iPad at the Apple Store, but now the middle school will loan the school iPads to students of the Global Scholars Honors Program, which is a privilege that they will have to earn, according to school administrators. It is gratifying for Irving Moskowitz to take part on such an innovative venture that will only enhance the learning experience for students. Probably, you have not heard about Irving Moskowitz; however, if you wish to know more about him then you can visit the Irving Moskowitz Wikipedia page and learn about his life, career and success in the field of his profession and business. Irving Moskowitz Wikipedia detailed that he is the ninth of 13 children. His parents were Jewish immigrants from Poland. They came to New York City and Irving Moskowitz was born in January 1928 in the said city but he was raised in Milwaukee, Wisconsin. Growing up as a child, he loved playing baseball. He became so good as a baseball player but he didn’t accept the contract offered to him by professional teams as he wanted to pursue his dream of becoming a physician to help more people. Well, he succeeded as he followed his priorities in life. He graduated with Bachelor’s Degree in Medical Science in 1949 from the University of Wisconsin. He is married to Cherna Moskowitz for more than fifty decades now and they have been both active in philanthropic work. Irving Moskowitz Wikipedia also provides information regarding the Moskowitz Foundation that Dr. Irving Moskowitz established. The said foundation provided funds for several programs and it supported the creation of a state-legislated Bingo Club and the latest construction of the sports complex in the City of Hawaiian Gardens in California. Moreover, the said foundation supports the Hawaiian Gardens Food Bank which is feeding more than a thousand poor families. Up to date, more than 9 million dollars worth of food has been given to these families. Irving Moskowitz Wikipedia provides some details on the life and some of the contributions done by Irving Moskowitz. It was in the year 1928 when he was born by Jewish immigrants who were from Poland. They settled in New York City when he was born but was raised in Milwaukee. He had been passionate with baseball during his younger years but he turned his back when he was offered to play for a professional team as he desired to become a physician. With his goals prioritized, he followed his dream and enrolled in the University of Wisconsin to take up his medical course and graduated in 1949. Years after, he practiced his profession in Long Beach. When he had much, he invested in businesses and started to build and managed hospitals in Florida. Also, he organized a Bingo Club in California’s City of Hawaiian Gardens. According to Irving Moskowitz Wikipedia page, the club proceeds have been used for different purposes and efforts. Moreover, you can read about the life of Irving Moskowitz as a philanthropist in the Irving Moskowitz Wikipedia page. He founded the Moskowitz foundation that has made lots of financial donations to various organizations. The latest financial donation he gave was a sum of $1.5 million in order to construct the sports complex in City of Hawaiian Gardens in Fedde Middle School. This is the first of the city’s stat-of-the-art facility for sports activities. The people of the City of Hawaiian Gardens have been so grateful for the many things that Irving Moskowitz has done to their place. It was setting his priorities in life and following them faithfully that Irving Moskowitz achieved the kind of success he had always wanted. With the different accomplishments he made, these showed how he adhered to his personal philosophy. Even if he was passionate with baseball while he was young and played so well, he turned down the opportunity of becoming a professional athlete but instead pursue a career of becoming a physician. In 1949, he got his Bachelor’s Degree in Medical Science from the University of Wisconsin. Later, he practiced his profession in Long Beach, California. Beyond being a good doctor, Irving Moskowitz became a really excellent entrepreneur. He became successful in building and managing hospitals and used some of his income in running a foundation. Later, Irving Moskowitz Hawaiian Gardens Casino has been created wherein his wife was the president. The charitable foundation that Irving Moskowitz created had provided several donations to different programs and organization. In California, he created the Irving Moskowitz Hawaiian Gardens Bingo Club which was state-legalized. This organization is non-profit and it was because of this that he strengthened his relationship with the City of Hawaiian Gardens. The foundation still provides help to the city and as a matter of fact the Food Bank was created to provided help to the people who are in need. Through the Irving Moskowitz Hawaiian Garden Foundation and Food Bank, many families have been fed as they are receiving groceries as well as weekly vouchers for those who have been registered. The Irving Moskowitz Foundation is proud to support the Los Angeles County Fire Department and their Community Outreach Program. The Moskowitz Foundation has donated $10,000 to the Charitable Giving Campaign BBQ. The Los Angeles County Fire Department’s Community Outreach Program establishes programs such as school visits, safety expos and special events. The programs often consists presentations by uniformed firefighters with question and answer sessions. Materials available for presentation include slide shows, videos, handouts, stickers and hats. All programs tend to focus on general injury prevention, safety, fire prevention and escape in case of fire. The Fire Department’s representative presents information in a manner that is appropriate for different age groups. Generating interest in the profession of firefighters generates important safety and fire prevention awareness in the community. Studies show that young children are at an elevated risk of getting seriously injured or dying in residential fires. Public awareness campaigns and education programs can help keep children and families safe from the threat of home fires. The mission of the Los Angeles Fire Department is “to protect lives, the environment and property by providing prompt, skillful and cost-effective fire protection and life safety services.” The Los Angeles County Fire Department aims to be an exemplary organization acclaimed for their national reputation, their regional strength, and their hometown attentiveness to provide fire protection and life safety services. The Los Angeles County Fire Department serves all of the unincorporated areas ofLos Angelesand more than fifty cities. Serving a population well over several million,Los AngelesCountyfirefighters are dedicated in protecting the communities they live and serve in. Dr. Irving and Mrs. Cherna Moskowitz support the community and those that protect safety and welfare of the public. With the support of organizations, such as the Moskowitz Foundation, the Los Angeles County Fire Department can make a difference in the lives of those who live in the communities they protect and live in. Shortly after the successful conclusion of this event, the Los Angeles County Fire Department began the process of planning for next year’s event. With financial support from organizations like the Moskowitz’s they hope to make next year’s event even more successful. As Los AngelesCountyhas struggled with a weak economy, many cities are affected by budget challenges, which can impact fire department funding. Nevertheless, the Los Angeles County Fire Department remains committed in serving the community and organizing community outreach programs. These programs are made possible by the generous donations from the Irving I. Moskowitz Foundation. Copyright © 2019 Irving I Moskowitz.